Use of Opiate painkillers to treat Migraines can lead to a potentially deadly addiction, fortunately, there are safe alternatives for pain relief. With this knowledge, episodes of both migraines and addiction can be reduced. 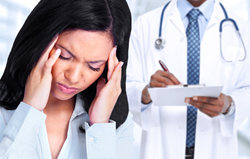 For pain management, many migraine sufferers are prescribed Opiate medications. Since June is Migraine Awareness Month, Serenity Recovery Center of Marne, Michigan, is warning the community about the dangers associated with using these narcotic painkillers as a treatment option. Migraines are more than just headaches, they are debilitating episodes that can cause excruciating pain, nausea, light and sound sensitivity, and vomiting. Because of the intensity of each migraine, many patients turn to dangerous narcotics in an effort to seek relief. As such, Serenity Recovery Center is warning against the use of Opiates, such as Vicodin and Percocet, for treating migraines and other headaches. They stress the importance of trying alternative therapies on patients with this condition. More than 30 million people suffer from migraines. These episodes can last for days at a time. Unfortunately, use of narcotics for treatment can lead to a plethora of dangerous side effects. According to the professionals at Serenity Recovery, “not only can these pills lead to rebound headaches once the medication wears off, it can also cause a serious and potentially lethal addiction to narcotics.” As such, they have proposed alternative treatment options, including relaxation therapies, Botox, and Biofeedback. Managing migraines can seem like an impossible task, but with the information provided by Serenity Recovery, sufferers can learn how to speak to their doctors about safe, alternative treatment options. With this knowledge, episodes of both migraines and addiction can be reduced. The alternative treatment options described by Serenity Recovery have helped countless patients manage their migraine pain without the risk of addiction. Whether patients choose safer medications or more holistic treatments such as meditation, the number of individuals suffering with migraines will decrease, leading to less substance abuse. Migraines can have a devastating impact on sufferers and their families. When narcotic medications are used for treatment, the effect can become even worse, often leading to a dangerous addiction. Thus, it is essential that migraine sufferers avoid Opiates at all costs. For more information, please visit the Serenity Recovery website, or call them at 1-855- 218-3775.